Red Funnel provide ferry services to the Isle of Wight. 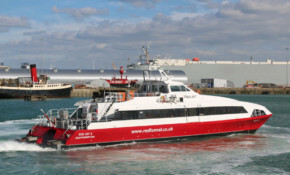 A high-speed catamaran service runs between Southampton and Cowes for foot passengers and between Southampton and East Cowes for vehicles. Below are some of the articles featuring Red Funnel. The local councillor says this development is "a positive step forwards" and that "by opening up the area, it will change the look and feel of our town comparatively". The former car park will be reinstated. The company say they do not plan to build on it. The Isle of Wight ferry company confirm they have suspended the Captain and his Mate following the second collision in East Cowes with yachts in the last few weeks. In a matter of weeks the Red Funnel ferry has once collided with yachts during thick fog. Sparking a search & rescue mission. The Red Eagle has been withdrawn from service to enable the preliminary investigation to be concluded, so Red Funnel have announced a series of cancellations on the East Cowes route.